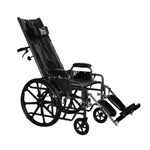 SOAR - ProBasics Full Reclining Wheelchair 16" x 17"
Home >> Generated from JAN's SOAR Information System on 4/21/2019 12:27:36 AM. ProBasics Full Reclining Wheelchair 16" x 17"
The ProBasics Full Reclining Wheelchair features removable desk-length arms and padded elevating legrests for user comfort. Additional safety and comfort are added on this K0006 wheelchair with rear anti-tippers and a headrest extension.